Htay Aung is having a moment. The 63-year-old retired professor of Marine Science sits at the foot of a Buddha statue atop a hill on Shwe Thaung Yan sub township, in Myanmar's Ayyerwady region, almost in meditation. Below him, a vast thicket of mangrove glistens in the gold of a setting sun. 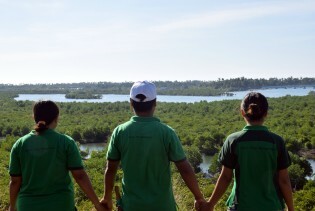 For Aung, this stretch of mangroves—known as the Thor Heyerdahl Climate Park—is a symbol of joy, hope and all things good. After an exhausting morning digging clams out of the mud of the mangroves, Rosa Herrera, her face tanned by the sun, arrives at this beach in southeastern El Salvador on board the motorboat Topacio, carrying her yield on her shoulders. Children growing up in the Seychelles think of the ocean as their backyard, says Ronald Jean Jumeau, Seychelles' ambassador for climate change. Suriname’s coastline is eroding so quickly scientists predict the country’s maze of mangroves could disappear in just 30 years unless there is urgent action on climate change. The importance of mangroves in protecting coastal areas under threat due to sea level rise caused by climate change may have been underestimated, according to new research. Thanks to its varied geography and climate, the Caribbean region is one of the world's greatest centers of unique biodiversity. With most people living near the coast, marine ecosystems, including mangroves, beaches, lagoons and cays, are essential not only for biodiversity, but as protection from storms. Many are now threatened, along with the coral reefs the region is famous for. From constructing barriers against rising sea levels to rehabilitating mangroves and providing agrometeorology services, the Caribbean isn’t waiting for a new international agreement on climate change to start implementing adaptation measures. But funding to roll out such projects on the necessary scale remains a key issue, and many communities remain desperately vulnerable to storms and flooding. Weekends and public holidays are deadly for one of Sri Lanka’s most delicate ecosystems – that is when the island’s 8,815 hectares of mangroves come under threat. In June 2014, Gaston Browne led his Antigua and Barbuda Labour Party to a resounding victory at the polls with a pledge to transform the country into an economic powerhouse in the Caribbean. When the Asian tsunami washed over several Indian Ocean Rim countries on Boxing Day 2004, it left a trail of destruction in its wake, including a death toll that touched 230,000. November is the cruelest month for landless families in the Indian Sundarbans, the largest single block of tidal mangrove forest in the world lying primarily in the eastern Indian state of West Bengal. Carlos Menjívar has been ferrying people in his boat for 20 years in this fishing village in western El Salvador surrounded by ocean, mangroves and wetlands, which is suffering the effects of environmental degradation. As the cyclonic storm Hudhud ripped through India’s eastern state of Andhra Pradesh, home to two million people, at a land speed of over 190 kilometres per hour on Sunday, it destroyed electricity and telephone infrastructure, damaged the airport, and laid waste to thousands of thatched houses, as well as rice fields, banana plantations and sugarcane crops throughout the state. Agriculture has always played an important role in the socioeconomic development of Guyana, one of just two Caribbean Community (CARICOM) member states that straddle South America. Theola Fortune can recall how residents of Victoria would ridicule her and others every time they went into the east coast village to warn residents about the importance of mangroves and the need to protect them. In the 1960s, the Cuban government declared that storage of fresh water for times of drought or hurricanes was a matter of national security, and it began to dam up the country’s rivers. But that policy has claimed an unforeseen victim: mangroves.